Sell more pies by offering them hot and ready to your customers. There is a growing trend towards hot food to go. At the same time people are becoming more discerning about what they eat. Eat Square meets this new demand with a quality eat-in-the-hand pie full of locally farmed and sourced ingredients. Hot pies sell well and are a profitable addition to many businesses. They are easy to install and use and we provide full training and backup. We have a range of pies specifically designed for pie cabinets. These have been tested and can be hot help for up to 8 hours. That means you can put a pie in at 11.30am and still sell it at 7pm. Our instruction manual explains how this works and how best to keep and sell pies. It couldn't be easier to install and sell pie products in your business. We offer a full service set up to help you every step of the way. This includes training in sales and equipment use to maximise your profits. We will also provide point of sale (POS) promotional material including A-boards, posters and signage to help grow sales and promote your new offering. An increasing number of pubs are adding hot pies to their menu. With no cooking, minimal equipment and space needs, they are an ideal way to boost sales and keep customers longer. 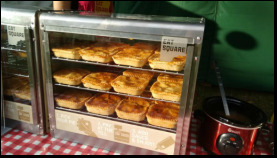 Pie warmers or cabinets are ideal for busy service stations, markets, bars, clubs, buffets, cafes and the like. They enable you to serve more people with hot food. If you are looking to maximise your GMROI then a pie cabinet is very effective. It occupies a small space and its display is attractive to customers and promotes sales. Our equipment comes with full instructions and training and could not be simpler for your staff to use. We offer cabinets with training and installation from just £500. 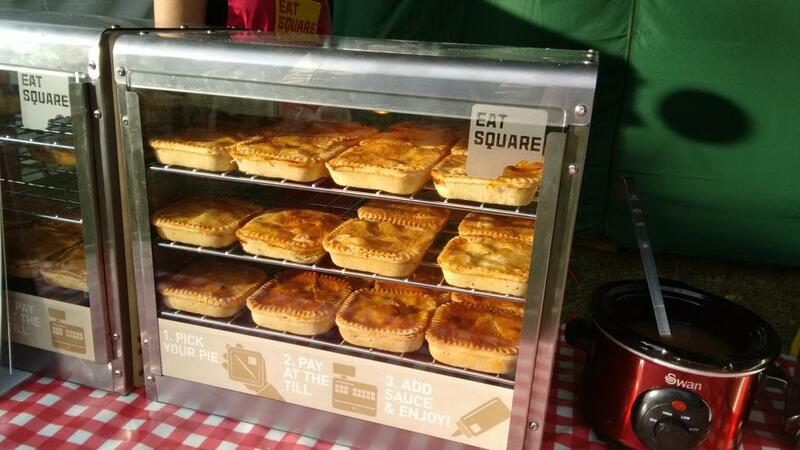 Pie warmers are generally available in 3 sizes which can hold 30, 60 or 90 pies at a time. They have a small footprint so offer maximum return for the space occupied. If you would like to know more about pie warmers and equipment send us a message from the contact page. It is easy to calculate how much you could earn. All we need are some basic figures such as sale price and estimated number of sales a day.